Are you ready to get your grumble on? This is a huge list of pug meetups, pug get togethers, pug events and pug happenings in the USA. Take a look and visit some awesome pug events happening in the United States in 2017. The 13th Annual Milwaukee Pugfest is right around the corner. Are you ready for the pug insanity that is the biggest pug meetup around?!? It all goes down Sunday May 21, 2017. Two buses will take you and your pugs on a mini tour of Milwaukee on Saturday morning, stopping at first at the House of Harley, followed by a drive-by tour of Milwaukee, proceeding to downtown stopping at the Riverwalk for the annual group pictures at the "Fonz" statue. After pictures with the "Fonz", the last stop will be to the famous Harley-Davidson Iron Horse Hotel where the staff will be throwing a *Yappy Hour" party for the pugs in "The Yard", allowing their humans to have lunch and adult beverages. "The Yard" is the perfect spot to grab a cocktail while you sit back under the colorful overhead sails that provide the delicate balance of sun and shade. The Iron Horse special events staff will have dog vendors providing dog bakery, pet pictures, and others. The Branded is a classic Milwaukee bar in the Iron Horse with a vintage modern dÃ©cor matches the cocktail list, with specialties ranging from old-fashioned high balls to brave new concoctions by Branded's resident mixologists. Offering the best bar food in Milwaukee, the Branded menu rocks classics with a kick. Try their suggested beer pairings that have been handpicked by their well-versed bartenders and Chefs! The bus will leave the Iron Horse at approximately 2:00pm to take you back to the hotel to rest for the evening "Get together Party". Tickets are $7.00 per human and covers bus rental and driver tip. Tickets can be purchased through the Pug Rescue Network online store, PUGJAVA Store website. We have the Comfort Suites Conference Center "Get-Together Party" that starts from 6pm-9pm. All attending rescues will have a table pre-selling their merchandise before the "Big Event". We will have the "6 Mutts Chicago Dog Food truck" that will be directly outside of the conference center. There is a cash bar with free soft drinks available. Each Rescue donates raffle items and baskets that are raffled off and all proceeds from the raffle are awarded to three attending Pug Rescues by a drawing. We will also have 2017 event apparel and merchandise for sale. Doors open at 9:45am and the first 300 families receive a "goodie bag" filled with various merchandise provided by various manufacturers. Services onsite include a pet photography by In Focus Photography; nail trimming by Madra Pet Styling; and animal communicator Robin Williamson. There will be demonstrations and contests. The contests include three categories of the Costume contest. The three categories are "Hand-crafted", "Ready-made" and "Strollers & Floats". Fr. John Allen will perform the "Blessing of the Pugs" which includes a general blessing and individualized blessings. There is also a Pug Race which medals and prizes are awarded to the top three winners. Pug Fest also has the "PUGFEST STORE" selling event merchandise, a 400 Item-plus Silent Auction, and approximately 70-plus vendors. 11:45 AM "Popeye & Sailor"
If you're proud when you can get your dog to sit, you'll be amazed at what the talented canine performer Sailor can do. Under the guidance of her trainer, Alex "Popeye" Rothacker, Sailor jumps rope, walks a tightrope and balances a ball while walking, to name a few of her dog-gone enjoyable stunts. Alex and his amazing dog act have performed throughout the U.S. and Canada for more than 20 years. They have made numerous TV appearances, including three times on "Late Show with David Letterman" and another on "The Tonight Show with Jay Leno," where the audience voted Sailor the "Smartest Dog in the World." Alex demonstrates animal training as well as the value of a good obedience foundation and pet safety. Respect for animals is also communicated. Alex entertains audience questions following the program, which may help anyone whose dog is not quite at the sitting-on-command stage. Afterwards Popeye and Sailor the Poodle will be available for up close & personal, and photo-op's. We are privileged to have the "Bluegrass Allstars" performing between 11am to 2:00pm. This popular group was again a hit last year when they strolled the Complex and randomly play requested tunes. One of the group's members, Dan Nimphius, has played at the Grand Ole Opry twice with Vince Gill. Renowned Cartoonist, Writer and Illustrator, Author of "A Cat's Life", "A Dog's Life", "A Pug's Guide to Etiquette" and "The Worrier's Guide to Life" will have a booth selling her work with a portion going to Pug Rescue. ADVANCED TICKETS - AVOID THE LINES AND SAVE MONEY!! Advanced Adult tickets are $6.00 each and Children under 10 years are $2.00 each for a limited time. We accept check, Mastercard, Visa and Discover. BE SURE TO INCLUDE A SELF-ADDRESSED STAMPED ENVELOPE. Adults $8.00 each and Children under 10 years are $3.00 each. $3 Parking Fee - Collected by Milwaukee County Parks Department. Milwaukee Pug Fest is looking for Vendors for the upcoming Milwaukee Pug Fest. If you are interested, please download the Vendor Agreement Form and return to us. We are looking for Volunteers to assist the committee in running the event. If you would like to help, please compete the volunteer form and either email it or send it to the addresses noted on the form. All Pets must be up-to-date on vaccinations. NO SELLING OF DOGS. VIOLATORS WILL BE REMOVED FROM THE COMPLEX. ALL Dogs must be on a FIXED-LENGTH LEAD - NO "FLEXI-LEASHES" Allowed. PUGS TAKE CHICAGO 2017: The Midwest's Best Pug Meetup! Imagine a place where all your favorite pug celebrities come together and you get to meet all their squishy faces! Well dreams come true with the upcoming #pugstakechicago event. A portion of the proceeds will support Northern Illinois Pug Rescue & Adoption (NIPRA)! This is going to be epic! Plus, @TuesdayThePug from New York; @BodieSpanky from Atlanta; @KirbyPug from Minnesota; @ChubbsTheWampug’s mom from Arizona; @Speakpug from Texas – and many more! Saturday, May 610:30 a.m. to 12:30 p.m. Pugs Take Chicago meets by the fenced-in dog friendly area at Lakeshore East Park in the Loop. Let your pug have some off-leash play time! Open to all ages. Saturday, May 61:00 to 4:00 p.m. Pugs Take Chicago PARTAY at Clark Street Ale House in River North (ages 21+ for humans)! Enjoy some cocktails and mingle with your favorite pugs inside the classic Chicago bar or in the large, fenced in patio in the back. Shop our raffle and maybe meet some adoptable pugs! Please plan to buy lots of raffle tickets:100% of the proceeds will go to NIPRA and MOPS! Both of these rescues do so much for homeless pugs in the Chicagoland area and are always in need of funding to pay for medical care and food. Exciting raffle prizes include a Pet Your Shirt gift certificate, a drawing from the talented artist @157ofGemma, bowties from Curly Tail Ties, a photo session with Cotrell & Co Photographers, a pug quilt from @BlindButNot, and more! Donations are still being collected for the raffle so if you have anything to donate, please let the organizers know! Sunday, May 710:15 a.m. to 11:45 a.m. Pugs Take the Great Lakes! Enjoy a pug-friendly boat cruise along the Chicago River and out onto Lake Michigan! Space will be limited. To subscribe for more information about the overall event, the cruise, and how to book your tickets, visit http://eepurl.com/cyk2Sz. Hard hitting reporter @momopug2000 took to the streets for The Grumble in the Jungle, aka Pugs Take Nyc 2016. She interviewed @roccopugzworld , the @pugdashians, @gwentheblackpug, @tuesdaythepug, and More! The gang met up in central park where we had a little meet and greet for the hoomans, then moseyed over to Times Square, where we let the puparazi grab some shots of the crew. Finally the whole crew ended up on Wall St at the Andaz hotel where there was a raffle hosted by the Pug Squad to benefit Bella the Pug. Finally there was an amazing pug costume competition, and wouldn't you know it? The @pugdashians took the cake! It was an exhausting day, but @momopug2000 blew this story wide open. We got the scoop on #treatgate and the best pics of #pugstakenyc below! Thanks to everybody who came out! We had a blast reporting on the event and look forward to next year! PUGS TAKE NYC 2016! If your in NY the weekend of Sept, 17th and 18th, get ready for the biggest grumble in the east coast. This is truly the Grumble in the Jungle! Not to be missed! 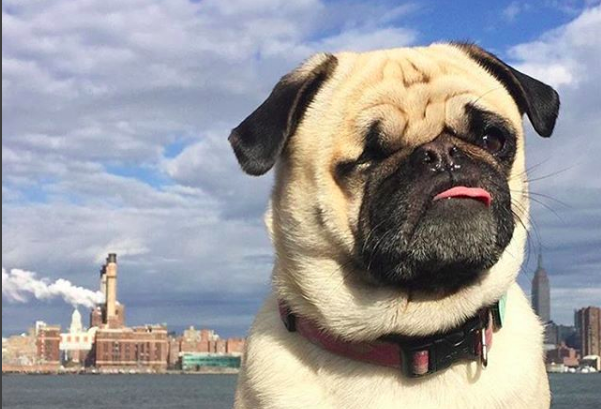 Come meet some of your favorite instagram celebrity pugs like @momopug2000, @hamiltonpug, @violet_pug, @realrufuspug, @otisthepugwalsh, @boogiethepug,@finnpug, @gwentheblackpug,@gilesthepug, @bodiespanky and more! 6 MUST HAVE TOYS FOR YOUR PUG! WHY DOES MY PUG BARK SO MUCH AND HOW TO FIX PUG BARKING PROBLEMS. 60 Clean Dog Jokes For Kids!